I take notes like a squirrel on the bird feeder—fast and full, getting it all down before someone changes the subject. You’ll know me by my notebooks. More often than not, however, the stuff that really sticks with me doesn’t require a scribble. My memory serves in certain moments where everything just makes sense—when it links up with something in my genetic code and delivers clarity. This happened last year when I met the Saurel family at their fifth-generation domaine, Montirius in Sarrians, which is located near Gigondas in Provence, France. The name Montirius contains part of the surname of each of Christine and Eric Saurel’s children: MON (Manon) – TI (Justine) – RIUS (Marius). The SAUREL family runs a completely biodynamic shop. “Our farm evolved progressively towards farming which respects more and more the environment, the vines, the land and the quality of our wines,” says the family. In the early ’80s, Eric’s father Max began to feel that there were negative impacts from chemical fertilizers, which they phased out of practice at that time. Later that decade, chemical weeding methods were neglected. In the early ’90s, chemical pesticides were abandoned and by 1996, the domaine was fully converted to biodynamics, with EcoCert and Biodyvin certifications. They describe the movement in fluid terms – progressive and more and more…there is a sense that they’ve let the arrangement unfold as time, practicality and wisdom would allow. But there were a few tipping points, moments that led to pristine clarity about the impacts of chemicals on thriving life. When I met with Eric he shared a story about the days when he and his parents would spray the fields with synthetic treatments. On these occasions the adults would tell the kids to go inside and stay inside—they didn’t want the children to be exposed. When they thought about this, said Eric, that every inch of life was saturated with foreign and potentially dangerous molecules, a switch flipped. And to think that the product they produced—wine grapes—was consumable, potentially transferring treatments into the human body. That woke the Saurels up. The improvement of the soil and plants by using preparations of vegetable, animal and mineral matter. Details: Horn Dung Preparation 500, Horn Silica Preparation 501 and Maria Thun (see next point) Horn Dung Compost. All other preparations include Achillea, Chamomile, Nettles, Oak Bark, Dandelion and Valerian. All are fermented and transformed into humus with the specific properties each of the bring influenced by one planet of a Solar System. These initiate the action of the composts in order to pass on the influence of the seven planets of the Solar System. We make our own compost under century old oak trees. The application of these products at precise times during the yearly cycle according to a lunar and planetary calendar. Details: The cosmic influence on the growth of plants have been noted for 40 years, based on the research of Maria Thun. These influences appear to be associated with the position of the moon, the sun and the planets of the solar system. Thun created a calendar, based on these observations. It defines the type of fruition stimulated by the moon or it’s planets. Therefor we have: Flower Days – favorable to flowers / Leaf Days – favorable to leafy plants / Root Days – favorable to rooting plants / Fruit Days – favorable to fruiting plants (such as vines). Working the soil by ploughing and weeding. Details: The Earth is Alive! It possesses an extraordinary living structure, billions of living organisms per gram. The fauna create a natural airing and porosity in the soil, which allows it to better absorb rainwater and limits erosion. This fauna also transforms organic matter into humus. We know that this exchange does not happen between the soil and the roots does not happen directly, but with the help of micro-organisms called mycorhize. By airing and lifting the soil, we improve the activity of the Earth, because sub-soil fauna is exclusively aerobic. This type of culture cuts the surface rootlets of the plant, which then incites the main roots to plunge deeper into the Earth to look for nutrition. Many farmers and consumers around the world are unsure that an organic or biodynamic practice works—unsure that a great tasting product with “shelf life” or distribution qualities can be achieved. There are parts of the wine-growing world that believe (and perhaps, rightfully) that they would struggle against the elements without some sort of synthetic treatments. Montirius is situated in Provence, at the southern edge of the Rhône Valley where they make wine in Vacqueyras and Gigondas. These areas are saturated with sunlight and receive hefty gusts from the Mistral, a bold wind from the north that tends to puff off any measure of mildew and moisture. These are good things for grape vines, nature lending a hand to the biodynamic method. The vineyards are all hand harvested by people who “live throughout the year by harvesting and love picking good fruit.” On the day I was there in October 2016, the family showed photographs of the recent harvest with the group wearing colorful, matching tee-shirts. Considerations are always made for well-being. All wines are vegan, gluten-free, and organic—with international certifications in addition to being biodynamic. The Saurels have an interest in the flow of experience—in fact, Eric demonstrated a movement filter he had created for the swimming pool on their property, designed to allow the pool to self-propel the filtration system. It is this fluidity, a sense of softness and dare I say ease (a word never uttered in terms of winemaking) that passes through the winery. This isn’t unapproachable wine—it exhibits the freshness and balance of herbal fruit quality that I expect in wines of the region. One may wonder if these efforts add to the bottom line, create a wine with a mismatched price tag. The range at Montirius runs from about 10€ to around 40€ … right in the pocketbook point for many wine drinkers. Big conversations are had around taste—but how does it taste? I sampled the full portfolio, enjoying each. I’ve had the experience—with these wines and others biodynamic wines of southern France—of finding a vitality in the glass. A level of liveliness in mouthfeel and flavor. Their wines have been awarded and noted by credentialed journals and tasters. Importers across the U.S. bring their wines to the states (to my Illinois friends, look to The Winebow GROUP for distribution.) These bottles are an exciting addition to cellars. Don’t rely on my memories—discover something for yourself in these biodynamic bottles from Montirius. we visited a couple biodynamic wineries in Spain. so fascinating! Well done as usual! Thanks Michelle! I’d love to hear about your experiences in Spain! Nothing weird about organics, for sure. It’s actually a very valid choice, and one chosen by more and more conventional farmers. But suggesting that biodynamics is only edgy because it’s simply not had enough exposure is somewhat off the mark. Biodynamics is mumbo-jumbo. Abracadabra. Witch-doctory. Voodoo. All the talk of preparations, lunar cycles and energy has absolutely no basis in scientific fact. Papers after paper have been published that conclusively deny these principles that were basically made up by an Austrian philosopher with very little understanding of agriculture nearly a century ago. The only reason I would suggest anyone should convert to biodynamics would be for purely cynical reasons. That is, you can ask a few bob more a bottle if you whack a Demeter logo on the back. I rate people who believe in biodynamics the same as I would those that believe vaccines cause autism. Both choose ignorance over science. 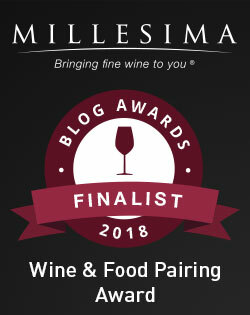 Hi Jill, I nominated you for the Unique Blogger Award : https://intastebudswetrust.com/2017/07/30/unique-blogger-award/ Cheers! Thank you! How lovely of you to think of me. Cheers! Lively in the mouth and with a vitality are things I hear over an over regarding biodynamic wines. There is science behind this, but perhaps some of the spiritual component is emebedded in the wine. Wine is after all, a living liquid, constantly evolving and changing in the bottle and the glass. At another biodynamic winery I heard someone say they didn’t want to spit it out because it felt so alive! One thing I love about the #winophiles group is continually learning from everyone. Each persons visit to a winery, like yours here, brings a different aspect to the given topic. And of course all winemakers/winemaking families have something special they do or have done. So interesting the Saurels added a “dab of water containing the geological qualities of the vineyard soil” to the mix of concrete for vats they created! Oh my goodness, their facilities are fascinating. They have a pool that filters itself through some technology they conceived to motivate flow, life force… everywhere there are things like this at Montirius! What an intimate look behind the scenes of a biodynamic farm. And in France! Very cool that you were able to visit. I especially like the details regarding their specific biodynamic practices. This was a cool visit, much appreciated warm welcome. Thank you for the wonderful virtual visit! And now I know the winery from Provence I want to feature next month!! Very cool — did you find some wine? Wow what a great visit that must have been. No wonder you didn’t need notes. When something this important grabs your interest you tend to remember it for years to come. What a great visit and so much good info! I believe I’ve had some of their wines in the past and will make sure to grab a bottle the next time I see one. So good to back the back story.